Use Promo Code HARMONY to receive $22 off your ticket purchase. Purchase your ticket here! 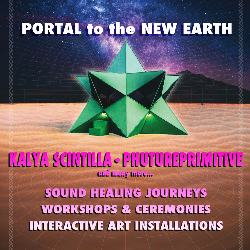 Guided by our Wisdom Keeper Elder Alaya Love, Portal to the New Earth returns to the magical private square mile community of Garth’s Boulder Gardens in Joshua Tree, Ca. 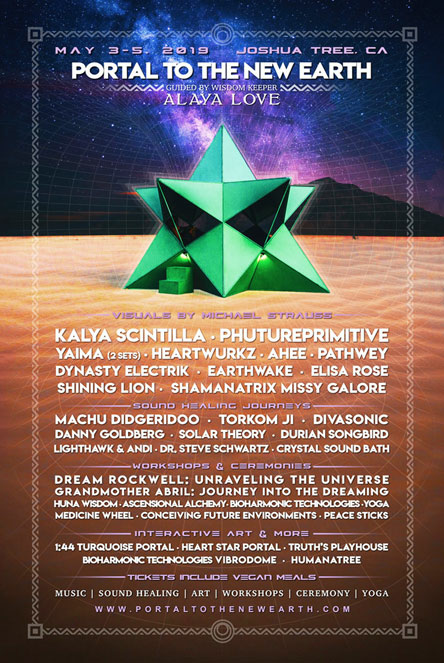 May 3-5, 2019 with a full lineup of workshops, sound healing journeys, yoga classes, acoustic and electronic music and interactive art installations. Environments and elixir bar by Truth Now andPrescott McCarthy. Organic vegan breakfasts and dinner by Sol Tribe Cuisine are included in the ticket price so we all share meals as a group. Workshops: Alaya Love - Huna wisdom teachings, Xi, Earthstar Healer - New Earth Wayshower, Gatekeeper & Intergalactic Grid Technician, Grandmother Abril and Samara Medicine Wheel teachings, Dream Rockwell - “Unraveling the Universe”, Dr. Steven Schwartz - "Harmonizing Quantum Physiology", Peace Sticks movement ceremony led by Shine Rilling, Anya Zema Deva - "Ascensional Alchemy", Humanatree People Planting experience led by Jangee, Harlan Emil - “Conceiving Future Environments” on the sacred reinhabitation of the Earth, Corinna Bernasko -"Awaken Your Potential to Transform The World", Deidra Vrooman - "Hone Listening of Subtle Senses", Clementine Libre - "Intentional and Deliberate Life — How to Command Your Experience" and Robin Liepman aka Bloom - "Permaculture & Drawdown via Movement, Music & Theater"
Yoga classes: Yin Yoga & Soundhealing with Kali Durga Yoga, Chakra Prana Yoga Nidra with Lynn Crounse and Sherry Weber's Aerial Yoga Swings. There is also a Dance Movement workshop by Andrea Lee with Light Hawkplaying live music. Sound Healing Journeys: Machu Didgeridoo, Danny Goldberg & Deva Munay Celestial Sound Sanctuary, Dynasty Electrik Crystal Sound Bath,Torkom Ji Quantum Harmonix, Lynda Arnold Divasonic, Durian Songbird, Light Hawk & Andi Lee, Dr. Steve Schwarz’s Bioharmonic Technologies Vibracoustic Sound Lounge and other incredible sound healing musicians. Live Music Friday night: Acoustic set by Yaima (again! ), Earthwake, Dynasty Electrik, Elisa Rose, Shining Lion and Shamanatrix Missy Galore. Sunday night will feature the transformative documentary on the vocal sound healer Tom Kenyon “Song of the New Earth” followed by an immersive sound and visual healing journey by Solar Theory. All three nights feature the incredible video projections by Michael Strauss. There is access to the amazing sauna and pool that Garth built into the boulders as well as Harlan Emil Gruber's Heart Star Portal and Sapphire Portal with the Quasar Wave Transducer vibrating it. There will be time to explore the pristine undeveloped square mile nature of high desert that Garth has stewarded for nearly 40 years. There is good drinking well water at many locations on the property. This is a drug & alcohol free event, our aim is to harbor the highest vibes and consciousness. This is a leave no trace event, be prepared to pack out all of your trash. Desert weather conditions are unpredictable, be prepared for both hot and cold climate.